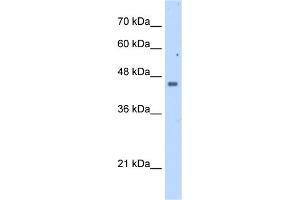 Attributs du produit This is a rabbit polyclonal antibody against FDFT1. It was validated on Western Blot using a cell lysate as a positive control. Sujet FDFT1 is a membrane-associated enzyme located at a branch point in the mevalonate pathway. The protein is the first specific enzyme in cholesterol biosynthesis, catalyzing the dimerization of two molecules of farnesyl diphosphate in a two-step reaction to form squalene.This gene encodes a membrane-associated enzyme located at a branch point in the mevalonate pathway. The encoded protein is the first specific enzyme in cholesterol biosynthesis, catalyzing the dimerization of two molecules of farnesyl diphosphate in a two-step reaction to form squalene. Publication Note: This RefSeq record includes a subset of the publications that are available for this gene. Please see the Entrez Gene record to access additional publications.